Launched in 2010 through the Integrated Greening Program (IGP), the Youth Environmental Services Program (YES) has seen hundreds of youth participating in the Green Economy in KwaZulu-Natal (KZN). The YES Program was designed with a focus on sustainable food gardens, accredited training, cleaning and greening of communities, providing community services and creating sustainable job opportunities. Over 300 000 youth are currently involved in the national Extended Public Works Program (EPWP). EPWP is seen as one of government’s tools to alleviate poverty and create work opportunities using labour intensive methods. EPWP has created 3.5 million job opportunities which is 58.3% of the target set by government to reach 6 million by 2019. 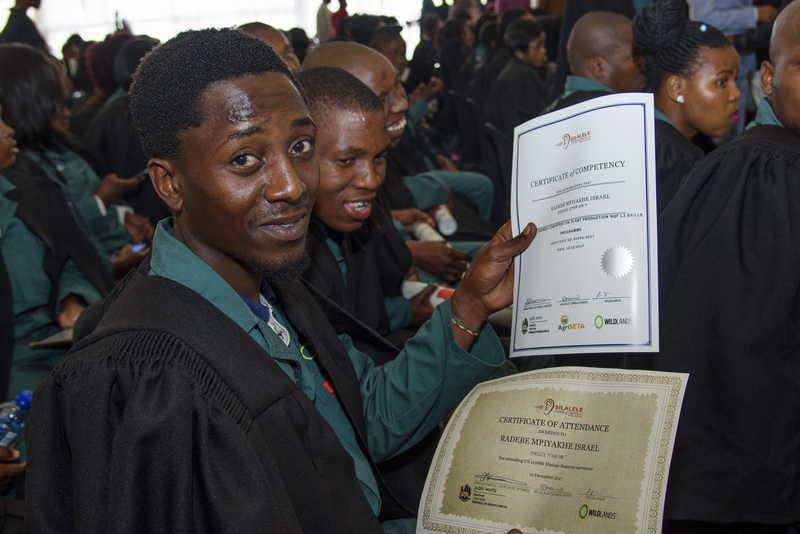 WILDLANDS, together with the National Department of Public Works (EPWP), witnessed over 160 youth graduate in various fields including Sustainable Agriculture and Business Studies, at the UGU Sports and Leisure venue in Port Shepstone last week. To further celebrate Youth Month, the Department of Public Works saw it fitting to also launch the National EPWP Recruitment and Selection Guidelines Program. This program was developed by the National Department of Public Works and jointly approved by the Minister of Labour in December 2017, with an aim to ensure uniformity across all sectors when recruiting participants within the EPWP target group. “The programme encourages young people to play an active role in the social and economic development in their own communities. The focus is on food security and providing young people with the practical skills to grow food, as well as the business skills required to develop sustainable businesses as small scale farmers. With WILDLANDS’ involvement, a major focus is on climate smart agriculture and the development of techniques that will allow these young farmers to produce crops in radically changing climatic conditions. The project hopes to channel youth towards the Green Economy and enable their participation in environmentally sustainable development,” concludes WILDLANDS’ Executive Director, Dr Roelie Kloppers.